A native Texan, Tom Pauken enlisted in the U.S. Army in 1967 and served as a military intelligence officer in Vietnam. Tom was on President Reagan’s White House Staff and headed a federal agency known as ACTION where he cut overall spending by 25% while initiating the successful Vietnam Veterans Leadership Program and implementing Nancy Reagan’s Just Say No To Drugs campaign. For his meritorious service, Tom Pauken was awarded the Ronald Reagan Medal of Honor by his fellow Reagan Administration alumni. 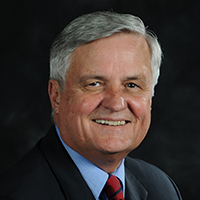 Elected Republican State Chairman in 1994, Tom helped build a Republican majority from the grassroots. A former venture capital executive, Tom is a small business owner and author of two books—The Thirty Years War: The Politics of the Sixties Generation and BRINGING AMERICA HOME: How America Lost Her Way and How We Can Find Our Way Back. He served as Chairman of the Texas Workforce Commission since 2008, stepping down from that position earlier this month. Pauken traveled the state extensively as Chairman of the Texas Workforce Commission calling for more emphasis on opportunities for vocational education at the high school and post-secondary school levels. He also established the Texas Veterans Leadership Program (TVLP) to help Veterans returning from Iraq and Afghanistan transition back into civilian life. He has been a strong advocate for tax and regulatory policies that encourage the rebuilding of our U.S. manufacturing base. Pauken plans to travel extensively across Texas to deliver his message about Texas’ future. Pauken is focusing on building a strong, grassroots organization and will make an official announcement at a later date. His campaign can be found online at TomPaukenForTexas.com. Pauken and his wife, the former Ida Ayala, live in Port Aransas and have seven children and thirteen grandchildren.